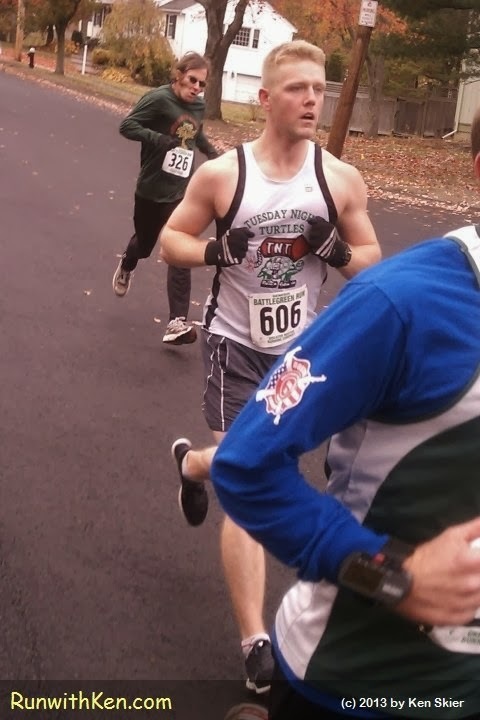 His shirt says TURTLE...but this runner is FAST! At the Genesis Battlegreen Run in Lexington, MA. The Tuesday Night Turtles is a running club in Rhode Island. This runner was just behind me when I took this photo. A moment later, of course, he was ahead of me--and then gone! I hope you like this! If so, please share it! They call me The Running Photographer... the Swimming Photographer... the Cycling Photographer. I run, swim, and bike in road races, mountain races, and triathlons...and take photos of the other athletes as they swim/bike/run next to me! I don't stop or slow my pace. These photos from inside the pack have an immediacy you can't capture from the side of the road. You'll feel so close you can almost touch the runners, swimmers, and cyclists! Open Water Swimmer SURGING above the froth--at the Max Performance Title 9 Women Only Sprint Triathlon! Swimmer at the Rio Olympics? No! This open water swimmer is cleaving the North Atlantic at the Wild Fish Swim Festival in Salem, MA! Open water swimming! At the One-Mile Lost Sailor Swim in Amesbury, MA. Open water swimmer--CLEAVING through Lake Gardner at the Wild Fish Swim! Dueling Open Water Swimmers REACH for the sky--at the Max Performance Sharon Triathlon! Slow Motion Video: BAREFOOT Running Technique--in Minimalist Shoes! Incredible SLOW-MOTION video: Barefoot running is like floating on AIR! Copyright (c) 2009-2014 by Ken Skier. All rights reserved. Powered by Blogger.